Ballpark Estimate: $250 to $4,500+. If you’re planning a wedding and want it to be an all-out incredible affair, how about hosting your reception in a tent? An increasing number of brides and grooms are renting wedding tents and using them as a frame in which to create their own amazing outdoor rooms. With the right details and special effects, this can be a magnificent setting your guests won’t soon forget. There are a host of wedding tent options available today, from simple awnings to large ballrooms, and everything in between. These structures provide a great way to throw an event with a romantic outdoor feel, while still offering an important way to shelter and protect your guests from the elements. Better yet, when you decide to go with a tent, you can locate it anywhere that space (and zoning) allows. And you can tailor the space with a variety of elegant extras sure to meet your unique needs and your taste. While renting a wedding tent can be the perfect way to get a custom place to hold your exciting event, wedding planners caution couples that this option can also end up being more expensive than you would expect. In fact, contrary to popular belief, hosting your wedding in a tent is often much more costly than having your wedding in a hotel ballroom or other established place. This is because while established venues come with most of the pieces already in place (such as the bathrooms, bar, windows and lightening), with a wedding tent, these items come ala carte, jacking up the final price tag significantly. It is not only the cost of a wedding tent that may be more than you bargain for. All of the extra features you will need to turn the simple white (or colored, if you prefer) enclosure from a rough shelter into a cozy and elegant haven can take lots of vision and lots of work, according to insiders in the wedding industry. For instance, some of the special touches brides often incorporate into their setting design include skylights, dance floors, chandeliers, dramatic pillowed-ceiling cover and satin wall draping to add ambiance and many other special details that can set the mood to the full extent. The great thing is that the sky is the limit – literally! But while all of these options can add just the right intimate feel to your big day, they can also take a significant investment and much coordination to get them all into place. With so much to consider, many brides who rent a wedding tent also hire a wedding planner to handle all of the logistics and make sure everything comes together without a hitch. You will want to check on the local zoning rules governing the location where you plan to place the wedding tent. For instance, you have to be sure your guests can legally park nearby and that you can play music at night.If you plan to the host your wedding on your land or other private property instead of at a licensed venue, you will want to check with your insurance agent and find out what your liability is and how to protect yourself if you will be serving alcohol. This can be a very important detail. You’ll need to have an idea of how many people will attend, since that will affect the size and style of the wedding tent. You will also need to take into account the time of year and time of day of your event, since that will affect the lighting, heating or cooling you will need. Also make sure there is an adequate power source nearby (or else plan to bring in a generator). Further, you will want to provide enough restrooms for your guests. The type of meal you provide also affects your choices. Will guests be served or will you need to plan for a buffet? In addition, along with dinner tables, will you need also some smaller cocktail tables? Also, will you want to cover the lawn with carpeting and add a dance floor? If so, these details will affect what you spend. If you are having a wedding tent set up on rented space, be sure to make sure that the area where you plan to house the structure is safe (without cables, wires or underground sprinklers that could get in the way). Also ask any tent rental company you are considering how they maintain and deodorize their tents in order to prevent odors or mildew, which could put a damper on your event. Finally, keep in mind that you will need to have the wedding tent delivered, setup, taken down and returned. All of these steps take time and can be an extra expense. If you want to find out more about having a tent wedding, there are a number of resources online that can help you get started. For instance, the Industrial Fabric Association International offers referrals to local tent supply companies, as does the American Rental Association and RentalSite. The experts recommend that you start contacting tent rental companies about six months before your big day to ensure you have enough time to find the right vendor and reserve the items you will need. When you call and compare different companies, you will want to ask lots of questions. First and perhaps most obvious, you will need to find out what is included in the price you are quoted. Make sure that you are comparing the same features from company to company so you can get a handle on how different vendors stack up against one another. 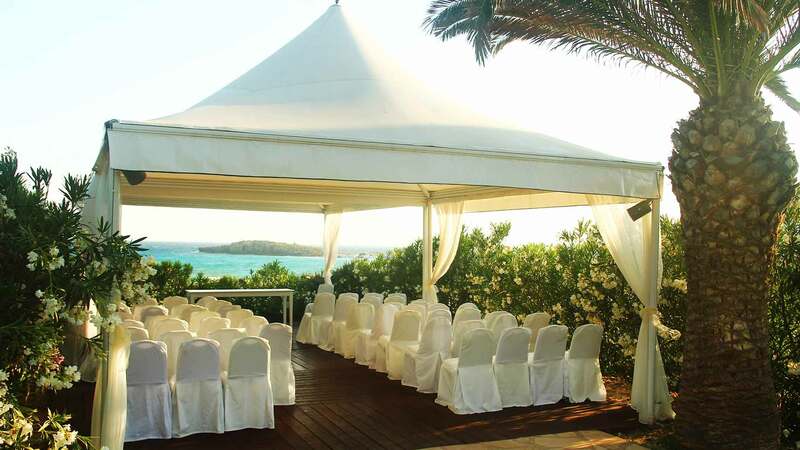 For instance, you should find out the length of time you will have the wedding tent, since some companies rent by the hour or the day, while others rent by the week. You should also ask if any tent you are considering is weatherproof (not all offer the same level of protection from severe conditions). Further, some companies include set up and delivery, while others charge extra for these things. And some couples report that some companies even charge a “drying” fee if the tent gets wet and needs extra care. Finally, always ask companies for references. Keep in mind that many tent rental companies also rent all of the supplies you will need and some even cater. This can make the wedding coordination much easier than contracting separately for each item. In addition, any company you go with should be insured, in case any damage occurs on the property during the installation of tear-down of the wedding tent. You need to take into account all of these details, since they can make a difference in what you spend, and also in the level of stress you can expect. For the wedding ceremony, assume you need about 6 square feet per person. For the wedding dinner, you need between 8 to 12 square feet for each guest (figure on the lower end for rectangular tables and the higher end for round). For the wedding dance floor, 2 square feet per person (but remember they won’t all be dancing at the same time). Serving tables for a buffet need about 100 square feet, while the DJ can take up 200 square feet. These can give you an idea of where to begin. You can also go to RentalHQ for some guidelines on tent size and heating and cooling needs. In addition, tent rental companies should be able to advise you on what to select for your specific needs so you can get exactly the best fit. Expect to spend a fair amount to create the perfect wedding tent setting for your upcoming wedding. The tent rental price itself can start at $250 for a small frame that can accommodate 25 to 40 guests, and the price can go up from there to about $500 or even more. For a medium-size wedding tent that is recommended for up to about 150 to 180 guests, the price starts at about $1,000 and can go up to about $3,000 or more, depending on how fancy the wedding tent is and the part of the country in which you live. An extra large size tent you can find, which works well for receptions of up to 500 guests, can range from $2,000 to about $4,500 or more. Keep in mind that the bigger the wedding tent, the more you will also need to spend on the details. For instance, rent heaters can run about $200 to $250 or more each, while a 12-foot square parquet dance floor can be about $2,000 or more and you can expect to spend up to $100 for each chandelier you rent. Satin wall draping can be in the $1,000 to $2,000 range, but the more space to fill and the more extravagant the effect you desire, the more it will set you back. And renting a portable bathroom can be in the $100 to $200 range for each. Other things you will need to rent can include tables, chairs, and linens, which can start at about $1,500 to $2,000 for the most basic options and go up from there many times over for more sophisticated choices. Sometimes your caterer will include these items in with the food, but not always, so you will need to find the situation that best meets your needs, your budget and your circumstances. When you add all of these details in, estimates for a wedding tent wedding range in the $8,000 to $12,000 for about 150 guests. The price of renting a wedding tent can be so high that some budget-conscious couples find that it can be more cost-effective for them to buy a used or wholesale wedding tent that they will be able to use again. Just keep in mind that when you buy a wedding tent, you still need all of the accessories and manpower to set up and take down, so you will need to factor this in. On the other hand, once you buy a tent, you will have it for future celebrations and events. Whether you decide to buy or to wedding rent, the bottom line is that pulling off the perfect tent wedding can be a challenging exercise, but the final results will indeed be well worth all of your time and expense.